On John Lennon's 35th birthday, his second son Sean was born in a New York hospital. Sean Taro Ono Lennon was born by caesarean section, and weighed 8 pounds and 10 ounces. Yoko Ono had been admitted to hospital some days prior to the birth, and was encouraged to have the c-section due to her age and three previous miscarriages. He had been conceived shortly after Lennon and Ono were reunited, following the infamous Lost Weekend in Los Angeles. Although the pair had met backstage after his performance with Elton John at Madison Square Garden on 28 November 1974, it was more than two months before he moved back into the Dakota. Shortly after the birth, John Lennon was quoted as saying: "I feel higher than the Empire State Building!" Elton John was invited to become the baby's godfather. 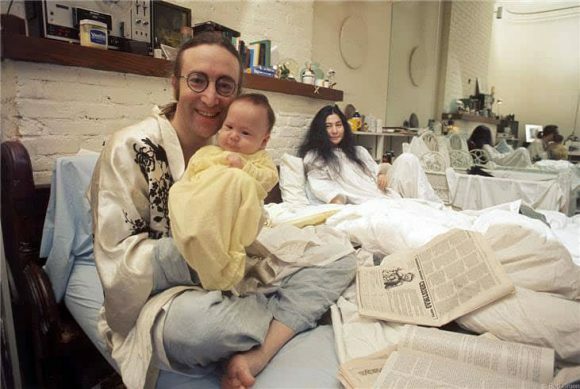 The birth of Sean marked the beginning of Lennon's five-year retirement from public life, during which he dedicated his time to bringing up his son. The release of the Shaved Fish compilation in November 1975 left him without recording obligations, and when Ono became pregnant he abandoned plans for an album called Between The Lines, to have been recorded with black musicians recruited by Carlos Alomar. Lennon established a routine of rising at 6am to plan and prepare meals and activities for Sean, while Ono took care of business matters elsewhere in the Dakota. The joy is still there when I see Sean. He didn't come out of my belly but, by God, I made his bones, because I've attended to every meal, and to how he sleeps, and to the fact that he swims like a fish. That's because I took him to the Y [92nd Street Y]. I took him to the ocean. I'm so proud of those things. He is my biggest pride, you see.